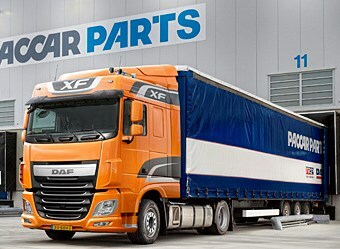 DAF have introduced a low-deck variation on their flagship XF prime mover. The fifth wheel height has been reduced to 96 centimetres, allowing the use of trailers that have an interior height of 3 metres. One of the trade-offs that come with having a lower ground clearance is the reduction in the capacity of the aluminium fuel tanks. The original Euro 6 XF featured a 1500 litre fuel tank, whilst the new low deck version will have just 1090 litres. Another interesting addition is the ability to have the vehicle enter a 'manoeuvring mode' whereby a button push will cause the rear of the chassis to rise by up to 50 millimetres. This is accomplished by having air suspension on the rear axle as standard. DAF claims that this feature "reduces the risk of the chassis and semi-trailer touching each other when driving on or off ferries or loading docks." This mode will only be active at speeds of 30km/h or lower, and will automatically shut itself down if the driver exceeds that speed. The new XF features the same 12.9-litre PACCAR MX-13 Euro 6 engine as the previous model. They will also retain the option to pick a power output of between 410 hp (300kW) and 510 hp (375kW). Later in the year a 440 hp (320kW) version of the PACCAR MX-11 will also become available. For more information, contact your local DAF dealer. DAF has finally shown off its latest Euro 6-compliant light and medium trucks.